Melrose has never had it easier. The garage is one of the most underused rooms in a home. Mostly because homeowners don’t know how to make complete use of the space they have there. Monkey Bar Storage creates customized garage storage in Melrose to get your storage organized. With customized products like shelving, overhead storage, and durable cabinets, you will be surprised you ever lived without it! Without a storage plan in place, chaos can quickly arise in a garage. 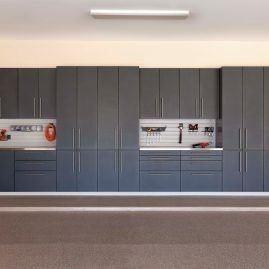 Monkey Bar Storage provides a plan and system for your garage, so it can stay organized for years to come. Affordable: We offer top of the line products at an affordable price, so you can stay within your budget. Accessories: We offer multiple accessories to complete our organization system. For example, we offer ski racks, bike racks, ball bags, shoe racks, and much more! Adjustable: Our system was created to be easy to adjust, so whenever your storage needs change your storage system can too. Garage Shelving: Unique shelving that provides multiple storage options. Garage Cabinets: lockable cabinets that hold up to 100 lbs per shelf. Overhead Garage Storage: Storage and safe overhead storage racks. Garage Flooring: Durable, waterproof, and protective flooring that looks great!